The murder trial of Kirk Matthew Lankford took a trip to Pupukea and the Kahana Bay area yesterday, where Masumi Watanabe was last seen. At Kahana Bay, Lankford's defense attorney, Don Wilkerson, carried away a shovel used by two women who were there yesterday, trying to find a missing body. 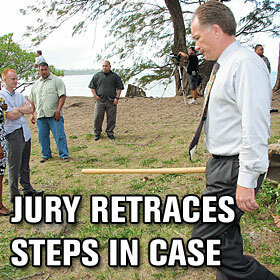 The jury was bought in shortly after and not shown the tools.